The ear is a group of sensory organs in the head that collaborate to produce the sense of hearing. Together these organs perform the amazing function of converting sound waves in air into electrical signals to transmit to the brain. The ear also contains several special structures that produce the body’s sense of equilibrium, or balance. Three major regions make up the ear: the outer ear, middle ear, and inner ear. The outer ear consists of the exterior structures of the ear, the auricle and external auditory canal. Visible on the exterior of the head is the auricle, the external part of the ear that extends from the head. The auricle is made of elastic cartilage and adipose tissue covered with skin. It is a flexible organ whose curves help to conduct sounds into the other structures of the ear. In the center of the auricle is the external auditory canal, a tube that conducts sound through the body’s exterior and skull and into the middle ear. The middle ear begins at the end of the external auditory canal with the tympanic membrane, or eardrum. The eardrum is a thin, circular membrane spanning the interior of the auditory canal. It vibrates in response to sound waves. Beyond the eardrum, the middle ear opens into a larger, air-filled cavity containing the three tiny bones known as the auditory ossicles. 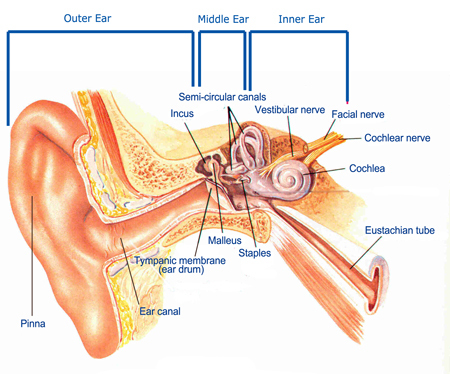 The auditory ossicles vibrate with the eardrum and conduct sounds through the middle ear to the inner ear. A small tube known as the auditory or Eustachian tube attaches the middle ear to the throat and allows the air pressure inside the middle ear to equalize with the atmospheric pressure. The inner ear is the final section of the ear. It receives vibrations from the outer and middle ear; converts these vibrations into nerve impulses; and conducts nerve impulses to the brain. Within the inner ear is the cochlea, a spiral organ that contains many delicate hair cells for detecting vibrations. The cochlea acts as the functional sensory receptor of the ear. Nerve fibers from the vestibulocochlear nerve attach to the cochlea to transmit auditory signals to the brain. Also found within the inner ear are the two equilibrium-detecting structures of the ear: the vestibule and the semicircular canals. The vestibule - a small, hollow region next to the cochlea - contains otolithic membranes that detect static equilibrium. Three fluid-filled, oval semicircular canals extend from the side of the vestibule opposite the cochlea to detect dynamic equilibrium. Each semicircular canal is aligned with a plane of the body – anterior/posterior, superior/inferior, and left/right – to detect movement in that plane. Hearing occurs in the ear when the auricle conducts sound waves into the auditory canal and on to the tympanic membrane. The tympanic membrane acts like a microphone by converting the sound waves into movements of the membrane, which in turn moves the malleus. The malleus taps on the incus and the incus, in turn, taps on the stapes to conduct the sound as bony vibrations to the inner ear. Tiny muscles attached to the ossicles contract or relax to attenuate the volume of sounds passing through the middle ear. The stapes pushes on a small hole in the cochlea known as the oval window, which in turn creates tiny ripples in the endolymph liquid filling the cochlea. These ripples are detected by hair cells inside the cochlea that are arranged within the spiral to each detect a specific frequency of sound. Each hair cell is connected to a neuron from the cochlear branch of the vestibulocochlear nerve that transmits auditory information to the brain. Static equilibrium - the sense of which direction gravity is pulling on the body - is detected by the otolithic membranes in the vestibule of the inner ear. Small calcium carbonate crystals embedded in a gel matrix on the surface of the otolithic membrane are pulled down by gravity and bend hair cells embedded in the membrane. The bending of these hair cells indicates which direction is down, and the nerves send this information to the brain through the vestibular branch of the vestibulocochlear nerve. As the head or body moves to a new position relative to the force of gravity, the otolithic membrane adjusts its position and sends new information to the brain. Dynamic equilibrium - the sense of rotational motion of the body - is detected by the semicircular canals of the vestibule. Each semicircular canal is filled with a liquid endolymph, which can freely pass through the canal. The base of the canal contains a gelatinous structure known as the cupula, which contains hair cells to detect movements of the cupula. When the fluid in a semicircular canal moves, it pushes on the cupula and stimulates the hair cells. The bending of these hair cells indicates which direction the head or body is moving, and the nerves send this information to the brain through the vestibular branch of the vestibulocochlear nerve.